Get excited, it's GIVEAWAY time! I've been thinking about hosting another giveaway here on Pretty.Random.Things. again for quite some time, and what better reason than to celebrate my blog reaching 1 million views! Yes, that's right, my blog has been viewed that many times, which is crazy. When deciding on what I should give away, I thought about what I personally would love to win; and that would be an online shopping voucher, of course. 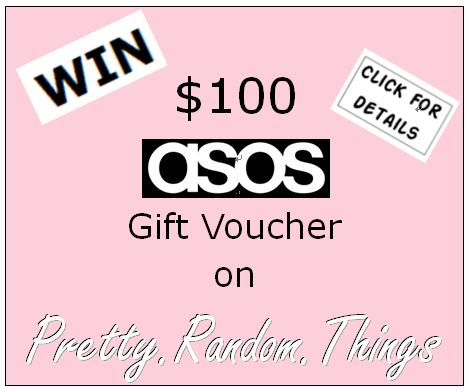 So I decided that one lucky reader (from anywhere in the world) will win a $100 gift voucher from one of my favorite online stores, ASOS. I love ASOS and order from them very often. They ship anywhere in the world for FREE, and they have a fabulous selection of items on their site. Shoes, clothes, accessories, beauty products, bags etc. The prices range from affordable to, well, not-so-affordable designer wear. They almost always have some kind of promo code available, so if you shop on ASOS, Google "ASOS Promotional Code" first and try to find an active discount code. Okay, so I'll stop rambling and tell you how you can win the $100 ASOS Gift Voucher. 2. There will be one winner, whom will receive a $100 ASOS Gift Voucher. 3. You MUST leave a comment on this post which should include a link to something from ASOS that you'd like to buy. 4. Sign in to Rafflecopter with your Facebook account or email address to enter this giveaway. This giveaway will close on May 2, 2014 and the winner will be notified within 2 days after that. Disclaimer: This giveaway is not sponsored by any company and the prize will be purchased by the owner of this blog. The owner of this blog is not receiving any compensation for hosting this giveaway. Some of the above links may be affiliate links. ASOS is probably one of my favorite stores! I'm so excited you're doing this giveaway! I would probably go on a sundress shopping spree! The Midi Skater Dress with short sleeves for sure! And maybe the rose printed skater dress too! I really like the Fulton Superslim Abstract Check Umbrella. I would to have this romper! So perfect for spring and totally cute http://us.asos.com/ASOS-Playsuit-in-Daisy-Print/124iok/?iid=3545125&SearchQuery=daisy%20%20print&sh=0&pge=1&pgesize=36&sort=-1&clr=Multi&mporgp=L0FTT1MvQVNPUy1QbGF5c3VpdC1pbi1EYWlzeS1QcmludC9Qcm9kLw.. I love the ASOS Classic Trench - http://us.asos.com/ASOS-Classic-Trench/12c8cy/?iid=3588728&cid=2641&sh=0&pge=0&pgesize=36&sort=-1&clr=Navy&mporgp=L0FTT1MvQVNPUy1DbGFzc2ljLU1hYy9Qcm9kLw.. I like the Skater dress in graphic print p/code 431396.curvy n stylish !!!!!!!!!! I love these heels. http://us.asos.com/ASOS-STANLEY-Pointed-Heels/12k88y/?iid=3903317&cid=4172&Rf947=4108&sh=0&pge=0&pgesize=36&sort=-1&clr=Yellow&mporgp=L0FTT1MvQVNPUy1TVEFOTEVZLVBvaW50ZWQtSGVlbHMvUHJvZC8. I love Asos so much! I've bought a lot of stuff from them and right now, I'd love to get this awesome pair of Jujus. Yes, I'm South African :-) It's a beautiful country, but we have a good life in Taiwan right now. Just to let you know I'm following via Bloglovin only, because my GFC is not working for 2 months already. I like a lot this red dress, is quite simple as my style, so it's perfect! I love ASOS! Thanks for the chance! This is one of my favorites http://us.asos.com/ASOS-Pleated-Cami-Midi-Dress/12zzn4/?iid=3994112&cid=8799&sh=0&pge=0&pgesize=36&sort=-1&clr=Mint&mporgp=L0FTT1MvQVNPUy1QbGVhdGVkLUNhbWktTWlkaS1EcmVzcy9Qcm9kLw.. I really love this gorgeous Botanical Bandeau Dress! I have been obsessed with Chelsea boots, and now they're on sale! I'd totally get these! http://us.asos.com/ASOS-Chelsea-Boots-in-Leather/10th68/?iid=2982691&cid=1935&sh=0&pge=0&pgesize=999&sort=-1&clr=Black&utm_source=google_product_search&utm_medium=paid&utm_campaign=google_product_search&WT.tsrc=Google%20Product%20Search&WT.srch=1&affid=2365&WT.srch=1&utm_source=google&utm_medium=ppc&utm_term=19884656305&utm_content=&utm_campaign=&cvosrc=ppc.google.19884656305&network=g&mobile=&search=1&content=&creative=37178136865&ptid=19884656305&adposition=1o1&gclid=CKyZzYTE270CFcqUfgodCVgAdw&r=2&mporgp=L0FTT1MvQVNPUy1DaGVsc2VhLUJvb3RzLWluLUxlYXRoZXIvUHJvZC8. I love love love this shoes, here is one of my favorite that I would buy if i won. So many awesome items to choose from that I absolutely love. One piece I would for sure purchase is the Wal G Leopard Waterfall Short Cardigan. Great Giveaway!! Really love this.looking forward to more!